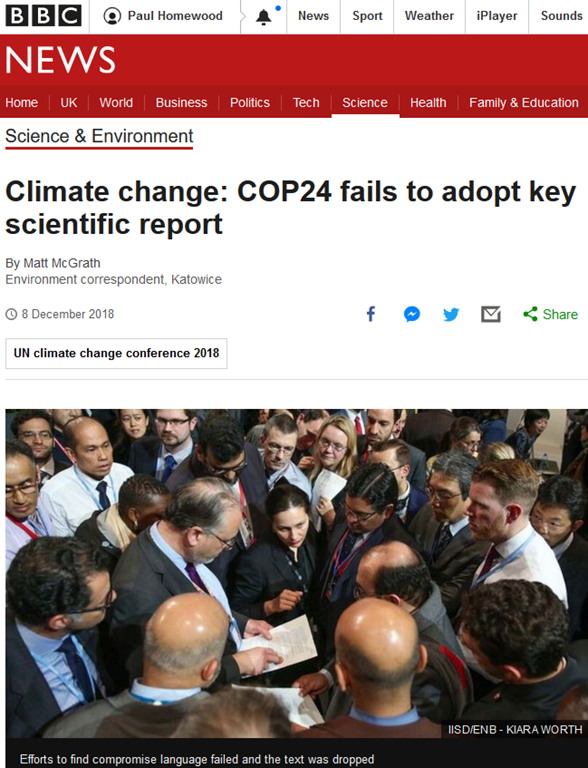 BBC: Attempts to incorporate a key scientific study into global climate talks in Poland have failed. The IPCC report on the impacts of a temperature rise of 1.5C, had a significant impact when it was launched last October. Scientists and many delegates in Poland were shocked as the US, Saudi Arabia, Russia and Kuwait objected to this meeting "welcoming" the report....With no consensus, under UN rules the passage of text had to be dropped. Paul Homewood comments: The most significant sentence is: "The report, launched in Incheon in South Korea, had an immediate impact winning praise from politicians all over the world." Precisely! It was never anything other than a report cranked out to satisfy a political agenda, as every other IPCC report has been. Let’s now hope that the US, Russia, Saudi, Kuwait, and hopefully a few others back up this stance with positive to stop Katowice in its tracks. And send a message to the UN and its paid for cronies that the world is no longer falling for its shoddy science and impoverishing policies. WILL TRUMP AND BRAZIL’S BOLSONARO UNRAVEL THE UN PARIS CLIMATE AGREEMENT?